“Wild Combination: A Portrait of Arthur Russell,” directed by Matt Wolf, has shown at the AFI Silverdocs documentary film festival in Silver Spring, MD this week, after showings in the Berlin and Edinburgh film festivals. The website is this. Wolf was present at the screening tonight. The 71 minute film (in HDCAM with some Super8) is a biography of the avant garde cellist Arthur Russell (1952-1992), singer and composer, who grew up in Oslaloosa, Iowa with progressive parents. He always wanted to be his own person with his music, and moved to a Buddhist commune in San Francisco in early adulthood. He found he could not “own” his own musical instrument and then moved to the East Village in New York, to a building on 12th Street, not far from Allen Ginsberg. He entered into a long term relationship with Tom Lee, who often speaks in the film. The film mentions his teenage acne, which persisted, but nevertheless he attracted men with his charisma. In the 1980s, he became HIV positive, and became ill with an HIV-related cancer and died in 1992, although he tried to remain active quite late into his illness. I believe that I may have me him once in 1978 when I was living in the Cast Iron Building myself in New York. I had a friend named Bill Bent, another musician who would move to San Francisco in late 1978 and set up a music studio himself with 80s technology. Bent composed a 90 minute “symphony” called “Sirius Lullaby”. I believe I met Russell once somehow through Bent. (I was visiting Bent and his partner in San Francisco on vacation on the "Black Monday" of the 1987 stock market crash.) Russell’s music did sound a little bit familiar. I had another artist friend, Ronnie Kahn, who composed a book called “Songs and Creations” and who sung at nursing homes. I also knew a artist named Robert Adsit and have one of his woodcuts (which would be shown in San Antonio). Another artist in the area was sculptor Stuart Lamle, who founded the water art company "Aquagraphics". The movie brought back memories of that year in New York City. I would move to Dallas in early 1979. I expect the film will air in some LGBT film festivals, and could make a logical selection for Reel Affirmations in Washington DC. 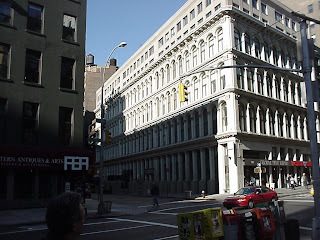 Picture: historic Cast Iron Building in NYC, where I lived 1974-1978.